The Bludger: Windows 8 and a new Intel CPU in one week. Geek alert. Stop reading now if you do not need exposure to nerdity. 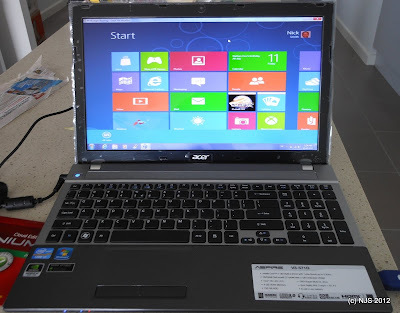 The above picture is my new acquisition, an Acer Aspire V3-571G laptop. It may not be the best looking laptop, but the selling point for me was that it is one of the first laptop models featuring the new 3rd Generation Intel i7 CPU. Specifically Intel Core i7-3610QM 2.3GHz. The chips were released to Manufacturers early this year and laptops featuring the chips have only just been released. Why is it so good? Well it has 4 cores and hyper-threading which gives an equivalent of 8 CPUs. This means that it will be fast and can support multiple virtual machines. Unfortunately Windows itself has trouble with multiple cores, so the full power will not be fully experienced in a Windows environment. I am also experimenting with Windows 8. Rather than destroying a perfectly good PC I have installed Virtualbox and created a Virtual Machine to run Windows 8 in. Once I had figured out how to add the Windows 8 ISO as a virtual CD then the installation went quickly and easily. I should mention that I am using Windows 8 Consumer Preview edition. This is freely available but cannot be upgraded to the proper release when it is available. Basically any work that I do on it will be lost. That is one reason for using a virtual machine. No great loss. Setup was straight forward. It required an Internet Connection and used my email address to connect to my Windows LiveID. Windows Live now has a record of my hardware, OS and password if ever I forget it. My first playing showed that Windows had found and accessed a Calendar of mine. Not sure which one, but it is populated with a pile of Birthdays of friends. Off hand that does not match any of my Calendars maybe it is getting them from Hotmail or somewhere. I have not linked it to FB or GMail so this is a mystery. Opening the mail client it prompted me to set up links to a variety of email services. I declined, I am not ready for that yet. I tried to edit the above photo, but it would not read the SD Card with the photo on board. Fail. That is probably a feature that I need to turn on in Virtualbox. My biggest issue is that I am going to have to learn a new interface. I don't know how to make Windows 8 do anything. The interface is too dumbed down for me. I cannot even work out how to shut it down cleanly. The Bludger has a pile of geekdom to explore.